[Android only] How do I use the exposure controls? The Android mobile app supports exposure controls, both automatic and manual, that lets you set the general brightness of the shot. To explain what exactly is exposure we took this definition from Wikipedia: "Exposure is the amount of light per unit area reaching a photographic film or electronic image sensor, as determined by shutter speed, lens aperture and scene luminance." When you first press the Exposure Controls button on the app's interface (as explained here) you'll see the following screen appear. 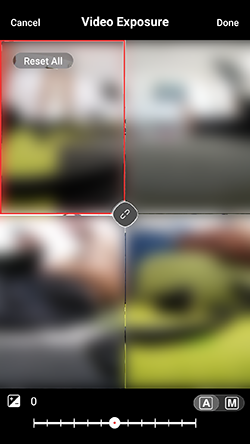 After the app finishes to load all 4 previews from the camera, it will give you the automatic exposure controls. By pressing each image the app refreshes the view and brings it to "life". After changing each setting in this window you should refresh at least one window to see the live preview and results. If you wish to effect all 4 windows at the same time the icon in the middle can link them all together and provide the same exposure settings to all 4. Please note: The link does not force all 4 to go live, to refresh all 4 you still have to press each one. 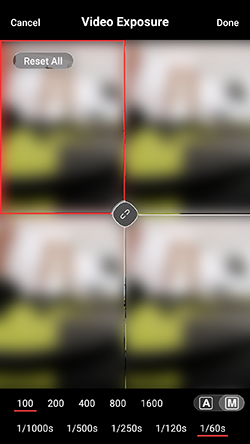 You can change the exposure to your liking with the slider at the bottom of the screen, change from automatic to manual controls, link the images together (in the middle), or Reset All preview windows by pressing the button at the top left corner. At any point you can decide you're done with the exposure settings and apply the changes you have made by pressing the Done button on the top right corner. 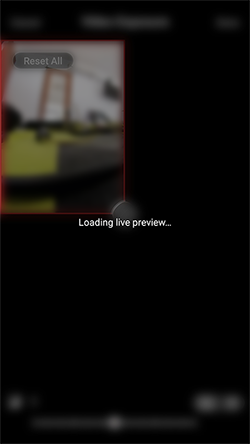 The manual controls, once chosen by pressing the A\M toggle on the bottom right corner, give you the manual controls of the app and the window will look like the following image. As you can see the upper numbers indicate the ISO parameter and the bottom parameters the shutter speed. Higher ISO values will make the image more grainy but provides more light to the image while higher shutter speed will reduce the light to the image. We recommend trying those values and options for yourself to get the best results your current shot requires. When done changing the exposure controls to your liking, press the Done button and the exposure controls window will close and go back to the main interface.